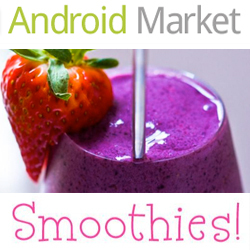 I'm excited to announce that my Smoothies recipe App is now available on Android, aka Droid system phones! Last June, I released my Smoothies iPhone App, and I have been thrilled by the response and feedback. However not everyone has an iPhone - and many of you requested an Android version of the App, and now here it is!.. * 100% Vegan, Dairy-Free! Most smoothie App recipes are not 'veganized' - mine are! No need to stumble through vegan ingredient substitution guesswork. * Tested Recipes. Each recipe was tried, tested and tasted by me personally. I provide commentary on each smoothie recipe - with quips about nutrition, lifestyle and ingredients. *The App that Grows. Yes, I'll be adding more smoothies to the App in the future - and you'll get free updates! All you have to do it buy it once. * Quality vs. Quantity. When Building my App I focused on the quality of my recipes vs. quantity of recipes. With 20+ recipes (and growing) you'll surely find enough ideas to keep you inspired and fight blender boredom. * Yummy Photos. Smoothie photos accompany each and every recipe. Some of the other smoothie Apps are stingy on photos. * Bonus Smoothie FAQ's and Tips are included. * Recipes Anytime, Anyplace. The App recipes are based on my blog recipes - but now you can get the recipes on your phone without an internet connection. Anytime, anyplace. Save paper - no printing out recipes needed. * Creativity! You won't find boring predictable smoothie recipes in my App. I always try to think "outside the blender" when crafting my creative, healthy, yummy vegan recipes. * Easy-to-Follow. Ingredients plus step-by-step Instructions for each recipe.